Turn pumpkin into something amazing! Here's a seasonal recipe that hopefully you will try for this Thanksgiving (if you're Canadian that's Monday; American Thanksgiving is in November), or any other holiday. It's a grand substitute for pumpkin pie. Sugar pumpkins are quite small. 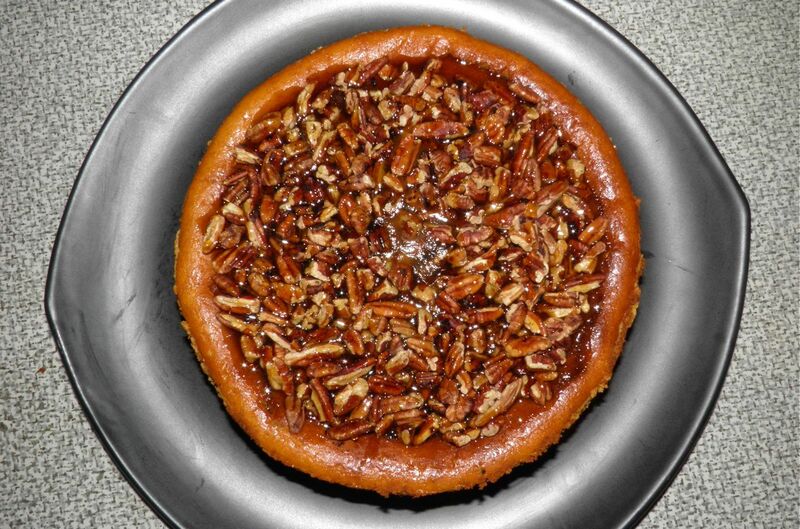 All the flavors of classic pumpkin pie are used in this cheesecake. Ricotta makes this much lighter than a traditional "all cream cheese" cake. I would venture that people who don't normally like cheesecake will like this. I have been making this recipe for several years now. I'm not sure about where originated, but suffice it to say that I've tinkered with it enough that it's now mine. I have made perfectly smooth topped ricotta cheesecakes in the past, but for some reason it seems that this particular one always cracks – and in the weirdest place. It doesn't crack down the centre, which is deadly for a cheesecake. It cracks around the edge. When I pulled this out of the oven it kind of reminded me of a soufflé. Fear not. It settles back down. 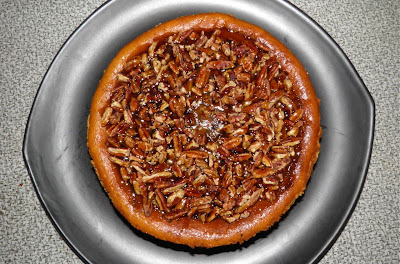 Interestingly this undesirable "effect" leaves a small indentation on top of the cheesecake which is perfect for arranging the pecans and sugar syrup topping. Sugar pumpkins (the small ones used for making pies) are only about $1 now. 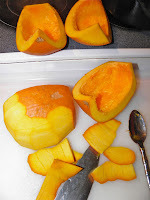 Either roast the pumpkin wedges, or seed and pare it and boil the pieces. 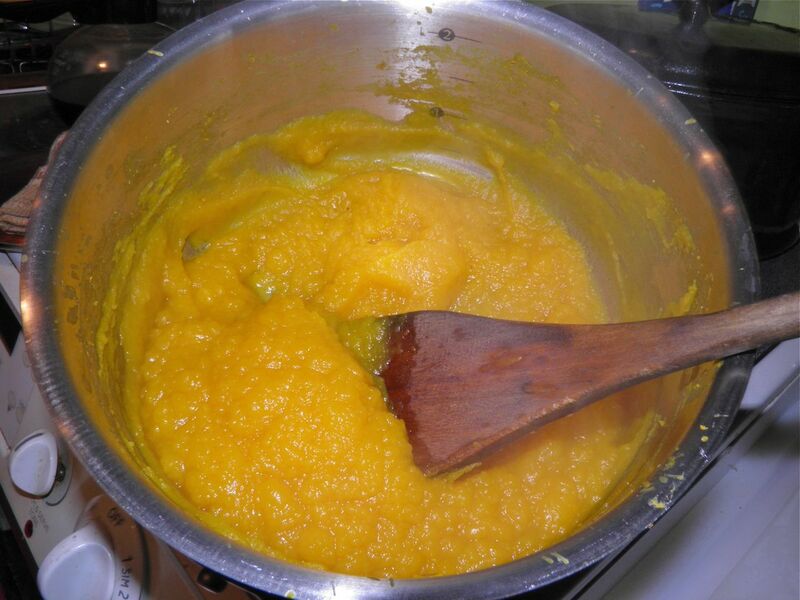 Purée the flesh very well after cooking until it is very smooth. It's best to do the pumpkin the night before you want to make the cheesecake. It's just easier that way. it and then squeeze water out of it. A word to the wise: Your pumpkin purée needs to be fairly dry. If you boil the pumpkin you will need to strain it of excess water. The photo at left is WAY too wet. 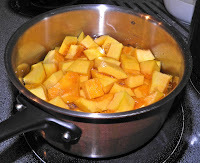 Put the cooked pumpkin in a piece of fine cloth and then in a sieve over a bowl. After the initial draining gather the cloth's corners and squeeze out as much liquid as you can. 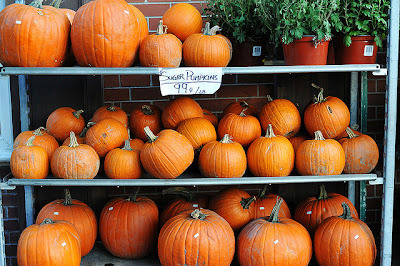 If you roast the pumpkin more water will evaporate than if you boil it. Depending on the pumpkin you bought you may still need to do it even if you roast. Water content varies greatly. I boosted the pecan flavour in this cheesecake by making the crust half ground nuts and half graham crackers. It turned out beautifully. If you run to the store right now you can have cheesecake for tomorrow! I bet in Canada you'll find ricotta and cream cheese on sale because Thanksgiving is this weekend. I did. The baked crust. It smelled wonderful. Yum! Pulse the pecan pieces in a food processor until well ground. Melt the butter and set aside. Add the graham cracker crumbs and sugar to the ground pecans and pulse to combine. Slowly pour in the butter and mix well. Turn out the crumbs into a 9” spring form pan. Press the crust evenly over the bottom. Bake in the oven for 8 minutes. Let cool before filling. 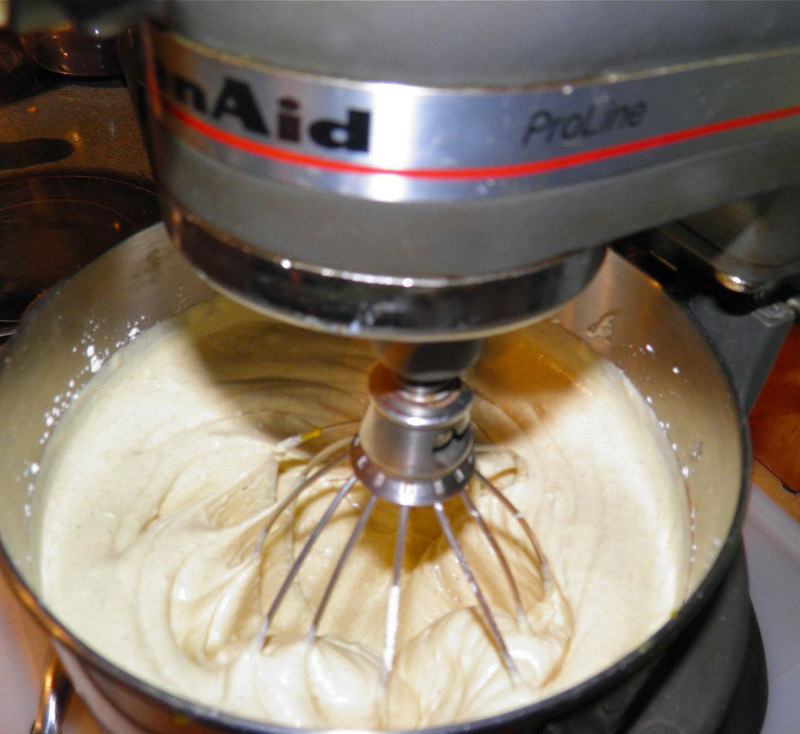 Combine the ricotta and cream cheese in a mixing bowl until smooth. Add the brown sugar. Beat the cheese until the sugar is dissolved. Beat in the eggs, one at a time, scraping down the bowl occasionally. 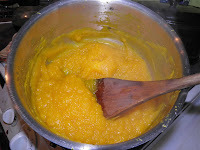 Add in the pumpkin, cornstarch, spices and vanilla and beat to combine. Pour the batter into the spring form pan. Bake the cheesecake in the centre of the oven for about 1 hour 20 minutes, or until the centre looks set but still jiggles slightly. 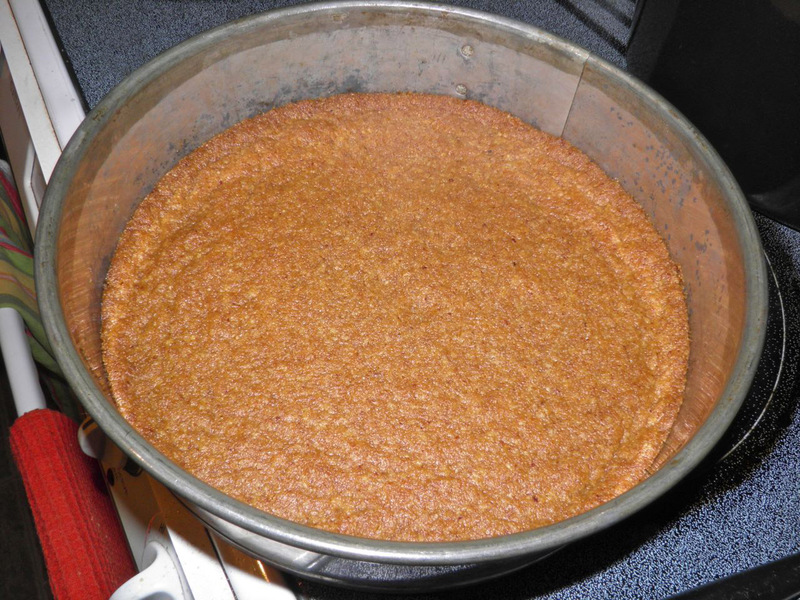 The cheesecake will firm up as it cools. Refrigerate until fully set up before making the topping. 4-6 hours or overnight works well. 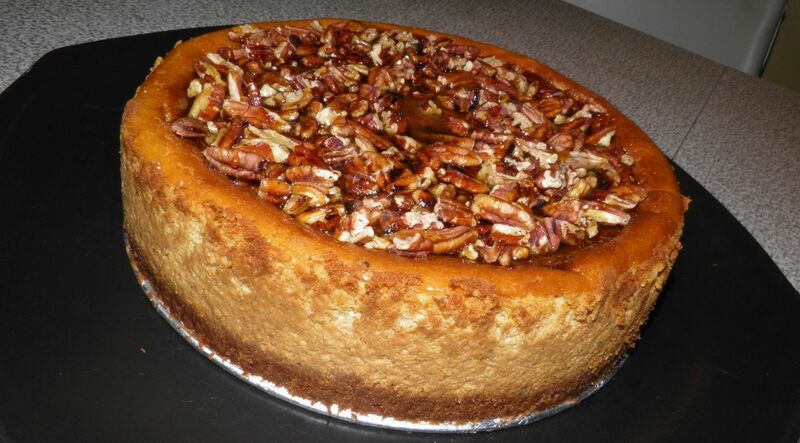 Arrange the pecan pieces evenly on top of the cheesecake. 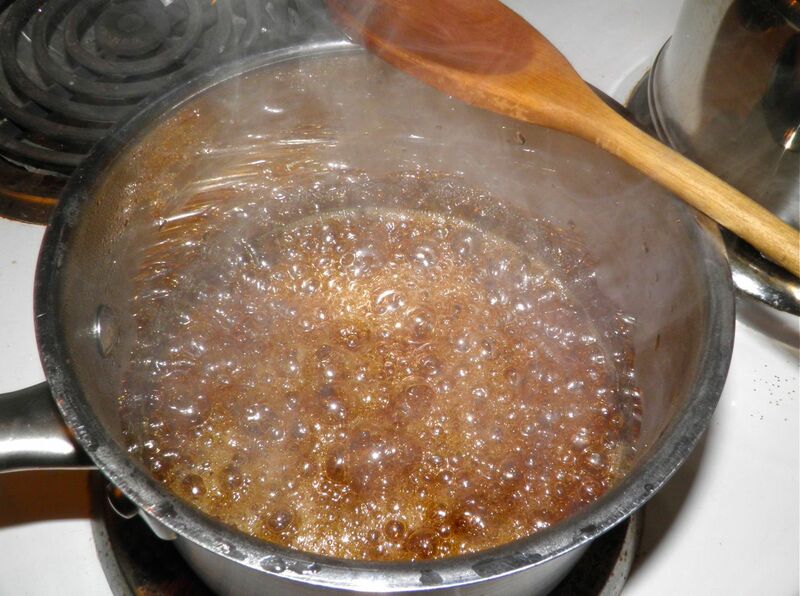 Combine the brown sugar and water in a saucepan. Bring to a boil and stir as the sugar cooks. Let cook until the sugar reaches soft ball stage (235°F). When I did this the sugar was at 235°F almost immediately. Use a thermometer! Pour the sugar syrup evenly over the nuts on the cheesecake. Let cool. Refrigerate until ready to serve.